More 1 Star chefs here. Other Nordics chefs here. First of all, the Nordic Wave is the term used to describe this group of chefs from all of Scandinavia, mainly from Sweden, Denmark, Finland and Norway. Indeed, these chefs known for 3-4 years at international level have particularly been at the forefront over the past two years. Due to the recognition of New Nordic Cuisine and the emphasis on a cuisine close to nature and the local products, they started to be heard. Barely thirty, Filip Langhoff is one of them and has been the chef of two of the best restaurants in Finland and Norway: Spisestedet Feinschmecker (Oslo) & Chez Dominique** (Helsinki). 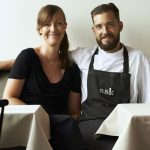 As a result, he has opened his own restaurant Ask* (Helsinki), with his wife who is managing the wine pairing. They just earned a Michelin Star in 2014. Born in 1980 at Helsinki, Filip Langhoff started his apprenticeship in the garden of his grandmother before learning the work in Oslo. 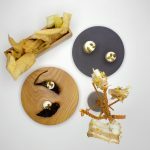 After a stint at El Bulli, he entered through ‘’la Grande Porte’’ and pointed as Head chef of Feinschmecker (2005) and Chez Dominique** (2010). Now he runs his company, CIBUS by Langhoff where he touches on all facets he loves in gastronomy. 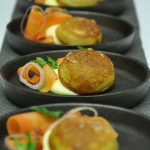 Such as catering, food styling, education and consulting together with his restaurant ASK. Yet, his cuisine of a high precision highlights the purity of flavors and local produce. Therefore, the ‘’terroir’’ is important and social contribution (of chefs) as well. But we’re going to restaurant for the experience and pleasure of the table. With Filip Langhoff, we are in the fine cuisine at its best! 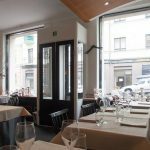 Moreover, Restaurant ASK* is a small an intimate restaurant with 26 seats in Helsinki. Indeed, they offer 4 or 8 course menus with carefully selected beverage menus. As a result, they source their produce from small farmers and producers. Same, all products come from organic or biodynamic farming, except the game, wild fish and other foraged products. Consequantly, their inspiration comes from the nature, the environment and the people around us. One of a new breed of young Finnish chefs helping to make Helsinki a destination for gourmet travellers. Filip Langhoff has won critical acclaim since opening Ask in 2012. Named Restaurant of the Year by the Gastronomic Association of Finland in 2013. Also awarded a Michelin star soon after. Due to the only 26 seats, reservations are increasingly hard to come by. Especially , Filip Langhoff had a spell at el Bulli. Before, he was working as the head chef at Oslo’s Feinschmecker and Helsinki’s two-Michelin-starred restaurant Chez Dominique. As a result, those experiences are reflected in his cooking. As such, some dishes may sound relatively simple on paper with just a few key ingredients. However, there is plenty of technique and refinement on the final plate. 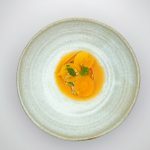 ‘Egg, nettle and emmer’ is a skilful combination of slow-cooked egg with puréed and deep fried nettles, crispy farro wheat and mustard vinaigrette. While ‘carrots, hazelnut and reindeer’ is accompanied by sea buckthorn, hazelnut mayo, hollandaise sauce and wild mushrooms. Most of all, Filip Langhoff serves many of the dishes himself, hunkering down by diners’ tables to explain his inspiration and where ingredients were sourced from. Also, his wife and co-owner Linda Stenman-Langhoff – a highly accomplished sommelier – pours the expertly matched wines. To conclude, the simple dining room with thick table cloths and framed drawings is a cosy space to enjoy the hospitality.